Another set of recipes. But these two walnut cake recipes are too good not to share. The worst thing is shelling 175 grams of walnuts all at one go: but when the nuts have been foraged for free, it doesn’t seem right to complain. So I won’t. This first one isn’t something to knock together with only half an hour to spare, but it IS very good. Thanks James Martin and the BBC Good Food website for this recipe,, which I’ve slightly simplified. Roll out the sweet shortcrust pastry on a floured work surface lightly dusted with flour to a 3mm thickness. Carefully line six x 7.5cm deep-sided tart tins with the pastry, pressing the pastry into the edges of the tin. Leave 2.5cm of pastry overhanging the edge. Leave the lined tins to rest in the fridge for 10 minutes. Line the pastry cases with greaseproof paper and then fill with baking beans or rice. Place the tart tins onto two large baking trays and bake in the oven for 10-12 minutes. Remove the greaseproof paper and baking beans or rice, then return the tart cases to the oven for a further 5-10 minutes, or until they are pale golden-brown. Remove from the oven and set aside to cool slightly. Trim the excess pastry with a sharp knife. Meanwhile, blend the prunes with a little of the Armagnac in a food processor to make a thick paste. For the frangipane, beat the butter and sugar together in a bowl until pale and fluffy. Beat in the eggs, one at a time, beating well after each addition, until all of the eggs have been fully incorporated into the mixture. Fold in the coffee and ground walnuts until well combined. When the pastry case has cooled, spread the puréed prunes across the bottom of the sweet shortcrust pastry case. Top with the walnut mixture and smooth to the edges. Meanwhile, for the candied walnuts, place the sugar and water into a saucepan and bring to a simmer. Add the walnuts and cook for a couple of minutes, or until just tender. Drain and place onto a large sheet of greaseproof paper. Carefully add the candied walnuts to the oil and cook for 1-2 minutes, or until just golden-brown. Lift out and drain on a fresh sheet of greaseproof paper. Leave until cool. 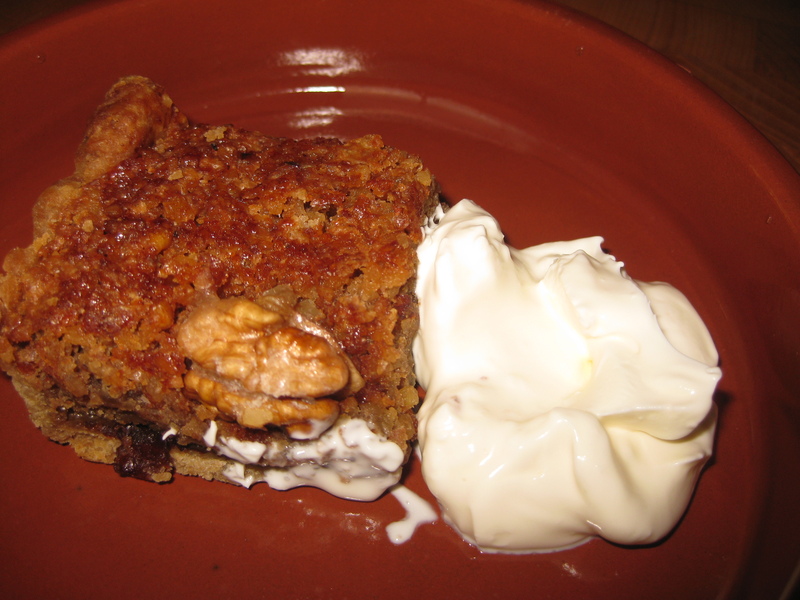 To serve, place each tart in the centre of a small plate and top with a few candied walnuts. Finish with a dollop of cream. Michel up the road gave me this recipe. It’s a nicely moist cake which keeps and freezes well. Mix half the sugar with the ground walnuts. Mix the remaining sugar with the softened butter and add the walnut mixture. Add 2 whole eggs one by one, and 2 yolks, one by one. Mix well then add salt, flour, cornflour and liqueur. Beat the 2 egg whites to soft peaks, and fold into the cake mixture. Pour into a well-greased 22cm cake tin and bake for 35 minutes at 200°C . The cake’s cooked through when a skewer inserted into the centre comes out clean. For a 24 cm. cake tin, bake for 50 minutes at 180°C. decorate with caramelised walnut kernels and a caramel sauce made with 150g. sugar caramelised in a thick-bottomed saucepan to which you add 30 g. of salted butter and 50ml. single cream. 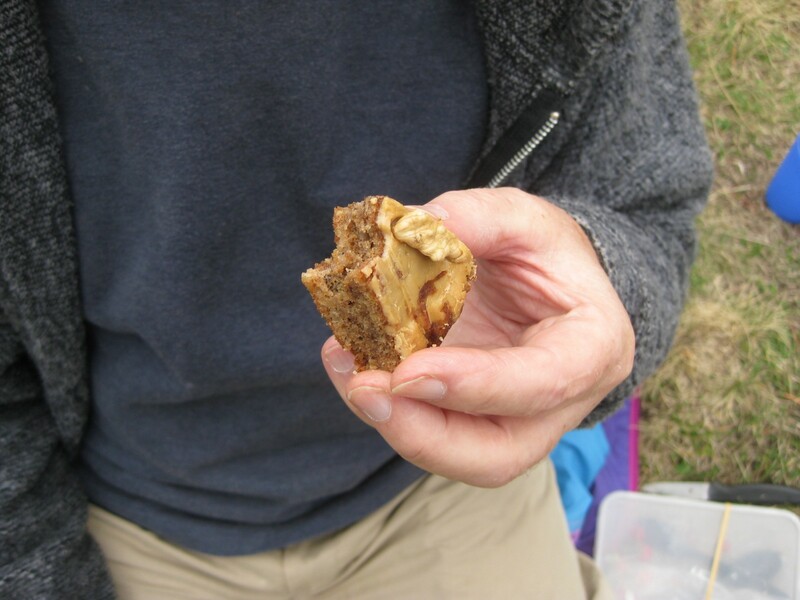 The tart looks very appealing – we’ve still using walnuts from last year. Although I have used quite a few on my recipe for double chocolate brownies with a wanut crust. Gosh! I didn’t think it was possible to gather so many walnuts in the UK! Impressed. This is exactly the recipe that I was looking for — I just received a huge bag of walnuts from a friend and was clueless. Thanks! It’s great having a cupboard full of these things in true peasant fashion, but sometimes the responsibility of dealing with them is a bit worrying, isn’t it? Well, indeed, you’re right, it’s not at all well known – not by me, for sure. I’m so glad I’m not one of the unlucky ones who can’t eat walnuts without problems.